One evening, Tuesday December 6, 6:30-8:30pm $50, everything included! In this workshop, students will learn about the technique of making felt fabric from loose wool roving. They will make their own elegant, warm, snugly, beautiful, handsome, thick, or thin scarf out of wool. All materials and instruction (and fun) will be provided! 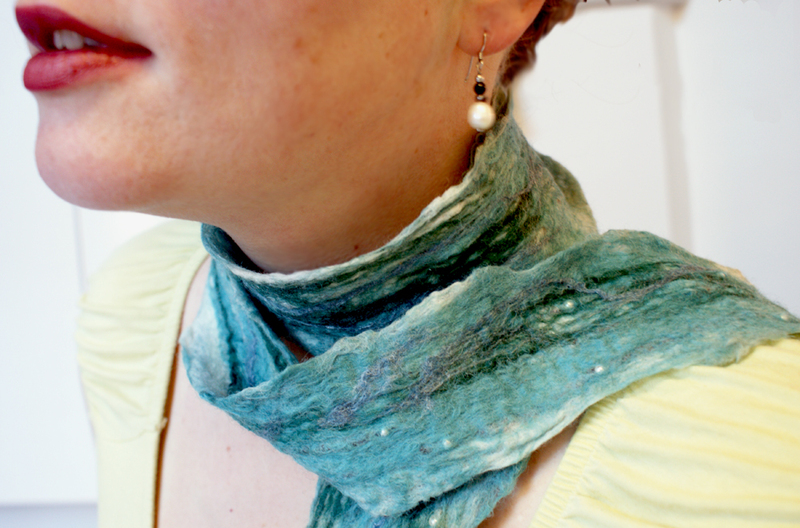 Instructor Natasha Henderson is a visual artist, painter, crafter of wool scarves, puppets, and cat-toys. She loves making things by hand and teaching others how to do so, too. She has years of experience teaching workshops in painting, felt-making, and other crafts. Her work (including felt scarves) can be seen in various galleries and shops, as well as being available for purchase online. Workshop is located in Fleurbain at 460 St Catherine West, Suite #917, H3B 1A7, Montreal.